It’s 2018 and I hope you all had a fantastic Christmas and New Year. After a very busy peak period for all of us at Twenty5Eight, the Christmas break was well needed. However just as the decorations were going back up in the loft, another monster week was hurtling towards us. The biggest consumer electronics show on the globe, CES! Held in Las Vegas, this behemoth of the tech world is a non-stop feature fest of all singing, all dancing gadgets that are available, coming soon or paving the way for future technologies. The show opened to a spectacular event by Intel and the Bellagio hotel, with hundreds of lit drones dancing in the night sky along to the famous fountain and music. As it was my first time to Las Vegas and CES, I was keen to get the most out of it. Downloading the official CES app amongst some others to help guide and inform me around the show was perfect. Then I called on the experiences of our Directors, Neil and Danny, to get around the city. I split my days at the show to cover different areas. 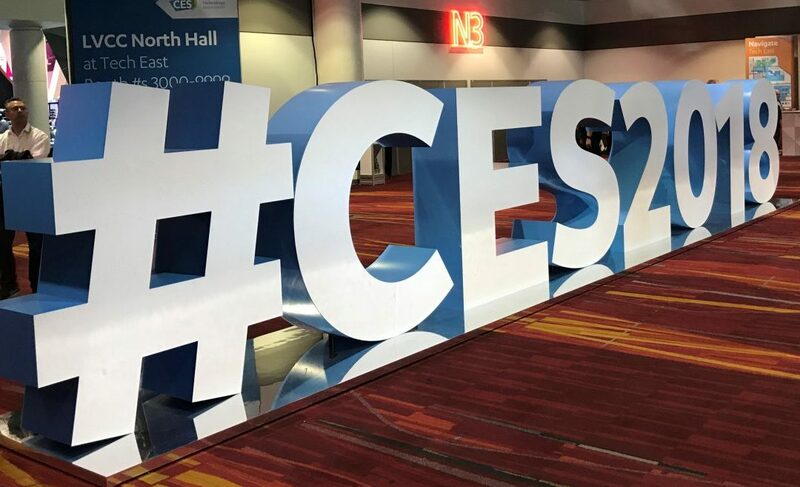 Walking over 103,000 steps throughout the week and covering 82km, the sheer size of CES is eye watering! Exhibitors, media and industry staff descended in their hundreds of thousands this year with over 190,000 attendees this year over a 2.6m Square feet. This year the stand out technologies belonged to the automotive industry. Consumer electronics predominantly was a ‘me too’ approach to new releases as well as minor increments in power, features and thinness. The developments by Intel and others in artificial intelligence, sensors and processing cores have been nothing short of incredible. Their acquisition of Iranian sensor company Mobileyes has helped them develop and shape their AI and autonomous functions massively. Chatting with one of the stand team about the road map for integration really hit home that driver-less cars are coming and SOON! Sony have decided to bring back an old favourite with some marked improvements. Their robotic dog Aibo reminded me of the days when Robo pets first came to our homes. And whilst the improvements are impressive, are we just looking at another product that will be in the cupboard again after 6 months or given to another family member to annoy? STEM (Science Technology, Engineering & Maths) is a growing buzzword in education right now. Learning authorities are pushing for STEM to take a greater role in the education of the current and future generations. As a result, tech companies have started developing products that are aimed at the younger generation to make learning about robotics and coding as fun as possible. From a very early age there are products available that help to teach logic to children without overloading them. These products are also scalable with age and understanding, with more advanced GUI based functions and instructions available. It’s really encouraging to see the developments being made by tech companies to help drive the STEM revolution in the education systems around the world. Some products seem to have their heart in the right place but, without a specified function or large-scale adoption to smart robotics by the consumer market, I feel that they are a little too early to the post. Kodak have made an interesting move from the field that we all know them from. Missing out on the digital camera movement has left them clawing for survival and their latest move seems a desperate one to become relevant again. However, moving into the buzzing space of Crypto Currency and Blockchain technology is something that I don’t think anyone would have guessed! Announcing two things at CES this year Kodakcoin, and their Kashminer for mining Bitcoin which you rent with a view of profit sharing. Google were a huge presence at the show pushing their Google Assistant at every opportunity. Their field team were on brand and whooped and cheered at every occasion in their boiler suits. Their engagement with the show crowd was spectacular and the energy they gave to the event was a credit to them as a brand and their field team! Virtual assistants are here whether we like them or not, and with the race well and truly on for who takes the crown in 2018, Google are currently in the lead. New for 2018 and our tech blogs, below is the good tech announcements/releases, the bad that have missed the mark and the downright ugly! Mesh WiFi: Gone are the days of having duff zones in your house where you are waiting for videos to buffer. Mesh WiFi has multiple hotspots around the home so that you’re totally covered no matter how big your house is or where you’re located. Driverless Cars: They are coming, and quicker than you think! Whether they are electric or not, the advancements in self driving and AI in cars has come on leaps and bounds recently. Combined with the upcoming 5G launch they will make greater leaps in the next decade. 5G & cloud based AI: With the introduction of 5G network implementation around 2020 this bump in speed and interconnectivity between devices will really allow AI based systems to learn at an incredible rate. Able to collect lots of data very quickly, all of this meta data can be used to help the evolution of driverless cars as well as untethering us from our reliance on wired connections within the workplace and at home. STEM products: STEM is a big growth area for schools across the globe. With a world that is becoming more technology led, the industries need an ever-growing number of people in those spaces. Helping tackle those shortcomings are tech companies who are creating STEM focused learning tools which teach coding, logic and robotics etc. Teaching a complicated subject whilst keeping it fun is a tough ask and the challenge to tech companies is how to overcome that and still ‘wow’ the audience. Smart Sleep tech: This year, CES saw a LOT of companies launch smart sleep technology to help customers get a better understanding of their sleep cycles and quality of sleep. Whilst the concept is admirable, spending a lot of money on something that tells you something you may already know, without giving proper guidance on how to combat it, seems as though you’re collecting meta data for the sake of it. Philips have created a device that you wear on your head that I can see people using for all of 7 days before putting it in the draw of no return! Segway robots, follow me, luggage: Robots which can find you at an airport based on facial recognition and guide you to your car, destination or pick up point is a great idea in principle, but do we really need it? The same company have also created self-balancing Segway luggage which follows you or can be controlled by remote. Whilst keeping your hands free to do other things and not have the hassle of lugging a weighty case about the idea isn’t a bad one, sometimes real-world considerations aren’t thought about… What happens if your case gets knocked over by an unsuspecting passer-by, or tampered with by someone, how would you know? Which raises security concerns over the device and also locating your luggage. Laundry bots: Whilst maybe a useful product for the hotel or care industry, it’s like that a laundry bot will be limited to the rich and famous but, are the garments they wear likely to be suitable for a robot to man handle and ruin? Kodak Crypto: Kodak as mentioned earlier have gone into the Crypto and Blockchain world. Will this work? Maybe, given the popularity of Crypto Currencies launches and the soaring price of Bitcoin. However, their mining hardware idea seems a little out of touch considering the processing power and energy requirements needed for profitability. LG Cloi (Chloe): Whilst Jibo (www.jibo.com) was one of the first forays into home companion robotics, LG have decided to give it a crack and have a product in our home to cater for our every whim. However, the phrase “never work with children or animals” might have to start including companion robots after the LG showcase left their VP of marketing red faced up on stage to go through the presentation without the scripted input of their companion. This I think highlights the real-world problems faced daily by customers using virtual assistants and other voice based systems. Companies are rushing ahead creating products they think we need, without stepping back and asking themselves, is the accuracy of the voice recognition system enough to make this thing work? Thanks for reading, here’s to a bumper 2018 full of technological advancements!